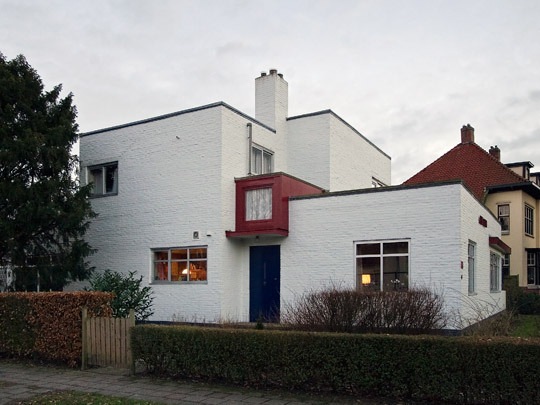 In designing this house for a notary friend Van der Vlugt broke away for good from his earlier, more or less traditional period. It is an asymmetrical composition of rectangular volumes each distinguishable from the other and comprising its own programmatic component — an elongated volume of two offices and a garage, a taller central section with entrance, kitchen and bedrooms, and a less-tall volume next to the entrance containing a living/dining room. The house has been partly altered and painted white.